Apple released its latest iOS iteration, iOS 11 Sept 19th as a free download with useful tips and how-to videos. We love the increased productivity and entertainment options for the iPhone and iPad - a significant leap forward in mobile technology. Here are six of our favorite updates in iOS 11 for the iPhone and iPad. iOS 11 makes the iPad more powerful and useful with multitasking. It is easy to open up a second app quickly from the Dock. Both apps stay active in Slide Over, new functionality available in iOS 11 with Split View, enabling you to see both simultaneously. There's a new Dock for faster access to apps and documents. Drag and Drop finally comes to iPad. This is huge as you can quickly move photos, files and text from one app to another, anywhere on the screen. 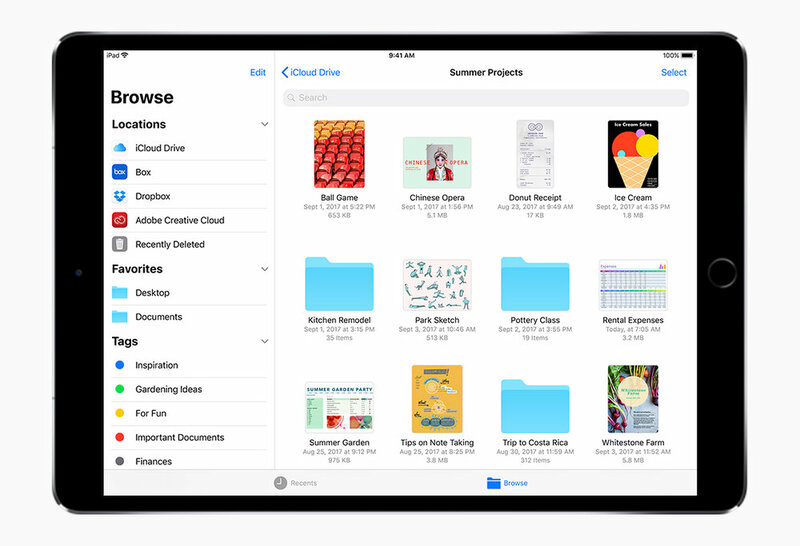 It is easier to find all your files now on your iPad especially with a new Files app that organizes all your files in one place, including your files in iCloud as well as third-party apps such as Box and Dropbox. Using the Apple Pencil on the iPad Pro just got to be more fun and useful simultaneously with iOS 11. It is easier to take notes, mark up images and files quickly. Combining these four features together - instant markup, drag and drop, file organization and multitasking turns your mobile device into a very powerful standalone productivity tool. In testing out this feature, we can attest to its usefulness. It can keep you from distractions such as texts, calls and other notifications. Anyone who sends you a message too will get a quick notification that you are driving. The notification also popped up however, during continuous motion such as exercise or just walking fast. Turning off the notification is fast, but we like having this option. We've saved the most exciting update of all for last. As we wrote about earlier in the summer after WWDC, Augmented Reality (AR) is now available on iOS 11. This opens up a whole new world of possibilities in terms of graphics, design, gaming, apps and the imagination. Augmented Reality can be useful in industrial design, home decor, for architectural models and in any scenario where you would like to test out virtual objects in real-world scenes. Apple builds upon the high resolution built-in cameras and powerful motion sensors and processors to provide high quality, immersive AR environments. With the new powerful A11 Bionic chip that provides faster graphics performance and new machine learning, Apple now offers an incredible platform for high end immersive 3D games and AR apps. We're excited to explore all this and build them out! Through the new AR kit and Apple's line of high resolution iPhones and iPads, we now have the opportunity to imagine new possibilities for any environment (travel, entertainment, shopping, residential and more). We are excited to build immersive, fluid experiences on iOS, the world's largest augmented reality platform and using the new iPhone 8 and iPhone X. Happy creating!